The laser documentary on Swami Vivekananda awaits a three-month USA tour across the nation, after its phenomenal success in India where it was displayed in a number of cities, received rave reviews and was nationally telecast. The US tour premieres in Denver, Colorado on August 24, 2013 and ends in Seattle, Washington on November 24, 2013. 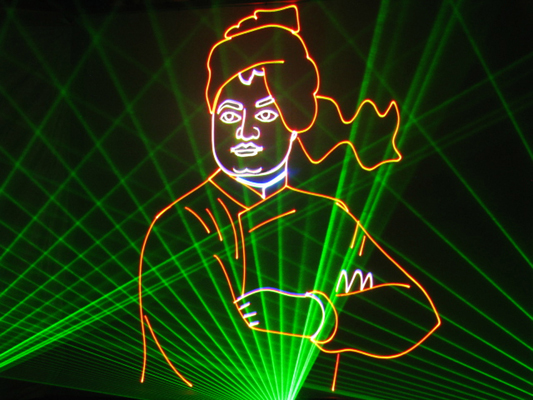 Although it is called a laser show, "Swamiji" is far from a traditional laser show, and is actually a well-researched 1.5 hour multi-media show with a predominance of laser. The show starts with "Vandana", a laser-live prayer dance dedicated to the Holy Trio, followed by an hour-long laser documentary on Swamiji. The opening of the documentary is a slide show of an old pictorial book displaying black and white original scenes of 1893 World's Columbian Exposition, Chicago and Swamiji at the Parliament of World's Religions delivering his famous speech starting with "Sisters and brothers of America". A gust of wind flips the pages to the beginning, when the old book and its pictures come to life with vibrant colors of laser animation and start the story on Swami Vivekananda from his birth. The making of "Swamiji" spanned off and on over six years, starting from Manick Sorcar's visit to the Art Institute, Chicago in 2006, when he was inspired to make the laser documentary on the philosopher-monk and started doing research on the subject with the help of the Art Institute library, and the Govt. of State of Illinois. The dream came true when he received an invitation from the Ramakrishna Mission Institute of Culture, Kolkata, India, to build a laser documentary on Swami Vivekananda to celebrate the 150th birth anniversary of the great monk. There was no looking back. He completed the storyboard and started on laser animation and 3-D special effects, which took another year to complete. In the show, he implemented a dozen of color lasers for graphics, animation and atmospherics synchronized with intelligent lighting, hazer machines, and surrounding sound system to present the mystical life story of the great monk of the nineteenth century in the state-of-the-art lighting of the twenty first century. The show had unprecedented success in India. The premier took place at a packed auditorium of the prestigious Science City (2,800 capacity), Kolkata, which is the largest science center in the Indian subcontinent under National Council of Science Museums, Ministry of Culture, Government of India. The show was inaugurated by Ms. Kumari Selja, Honorable Minister for Culture, Housing & Urban Poverty Alleviation, Government of India, who lit the lamp followed by Vedic Chanting by Ramakrishna Mission devotees. The show captivated the audience for the entire 1.5 hour. For the next four months the show was on a tour at various cities where it received rave reviews from the press and media. On January 20, 2013 it was nationally telecast by the renowned news-channel of Bengal, "ABP Ananda" of the Ananda Bazar Patrika. "It was indeed a marvellous show, to say the least. The packed audience of the main auditorium of the Science City thoroughly enjoyed the premier-show as it was vastly research-oriented and professionally created..."
"... Apart from the very impressive display of laser technique, what gladdened our hearts was the accuracy, authenticity & the appropriate nature of incidents, music, narration, etc....The Western audience would appreciate the show even more because Swami Vivekananda's message of harmony has been beautifully highlighted...."
"The life of Swami Vivekananda came alive through a first-of-a-kind documentary made in laser..."
"...Full of animation and 3-D effect, the documentary uses cutting-edge laser technology to transport the audience to a world where art fuses with science seamlessly." Manick is immensely grateful to many of his friends and relatives in Denver, Colorado Springs and California who contributed their unparallel talents in voice, songs, music, dances, constructive criticism and sound advices in its successful completion. After winning the heart of India, the show is now here for the US tour. No matter what part of the country you are in, Sewa International USA cordially invites you and all your friends to find the nearest city from the list below and be proud to connect with the messages of the great monk through the show of a lifetime experience.